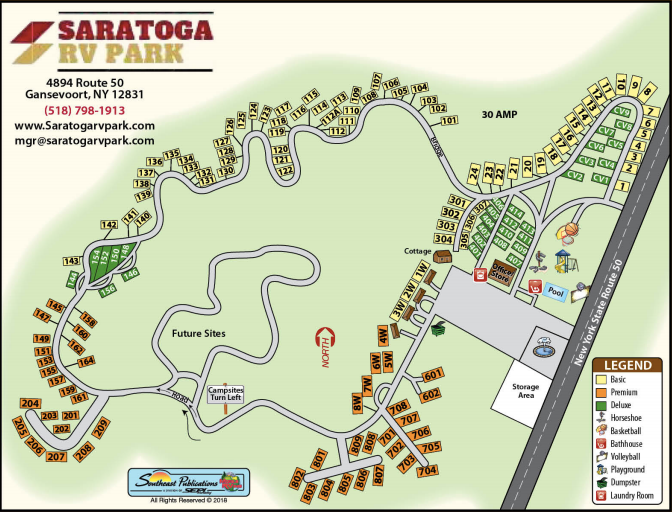 Saratoga RV Park is a majestic, pet-friendly, RV campground that offers a wide variety of outdoor activities and full-service amenities to our guests. This 154-site RV Park is perfectly located in the Saratoga Springs area of New York. Just off the Adirondack Northway (I-87), Saratoga RV Park is just 10.5 miles from the world famous Saratoga Race Track, 12.5 miles from the Saratoga Spa State Park, and 10.0 miles from the Saratoga Performing Arts Center. With all the shopping, dining and local activities in the area, you’ll never be at a loss for things to do or explore. This active RV park features full-service 30 Amp and 50 Amp hook-up sites, a heated pool, hiking/biking trails, laundry facilities, remodeled showers, video game room and propane sales. Plus, we have acres of outdoor storage for RVs, boats, trailers, & vehicles. All of our sites come with water, electric, and sewer. With a new owner, vast improvements are being made throughout the RV park. More activities are being scheduled for guests in 2019. This is the perfect location for campers of all ages. Sites in Saratoga RV Park are filling up quick, book your site for 2019 today!